Persistence Market Research’s recently published research study on the flexographic printing machine market, titled “Flexographic Printing Machine: Global Industry Analysis, 2013-2017, and Forecast, 2018-2028” offers a detailed value-volume analysis of the flexographic printing machine market along with insights on market value (US$ Mn) and Y-o-Y growth on the basis of product type, technology, coloring capacity, application and region. In terms of volume analysis, the volume of flexographic printing machines – on the basis of coloring capacity, such as 2 color, 4 color, and 6 color & above – has been considered in units (i.e. the number of flexographic printing machines). The report on the global flexographic printing machine market provides forecast factors, macroeconomic factors, market definition, Porter's analysis, and other factors that influence and impact the global flexographic printing machine market. The global flexographic printing machine market report includes market dynamics such as drivers, restraints, trends and opportunities. The global flexographic printing machine market report provides the data for the financial year 2017 with an inclusive analysis of the market forecast for the period 2018 – 2028. For the better understanding of readers, the report has been categorically segmented into different sections on the basis of product type, technology, application, coloring capacity, and region/country. The first section of the flexographic printing machine report includes market introduction/definition, taxonomy, and market definition by segments. The second section of the global flexographic printing machine market report includes macroeconomic factors along with value chain analysis, drivers, restraints, trends, and opportunities and pricing analysis. In the subsequent section, the flexographic printing machine market viewpoint has been covered, which includes the global value and volume analysis. The report provides significant information pertaining to the above-mentioned segments in the global flexographic printing machine market. The final part in the market background is included in the impact of the forecast factors, which include a study of the factors that are expected to have an impact on the flexographic printing machine market, such as technological growth, investments and other key insights pertaining to the market. The sections that follow consist of the global flexographic printing machine market analysis by product type, technology, application, coloring capacity, and region/country. The overall analysis of the flexographic printing machine market for numerous regions depends on the macroeconomic environment of the particular regions. Each regional section of the report contains qualitative data and quantitative aspects of the global flexographic printing machine market. In the final section of the report, we have provided a competition analysis with company market share analysis pertaining to the flexographic printing machine and performance of manufactures by tier down structure of global flexographic printing machine market. In the competition dashboard section of the global flexographic printing machine market, we have provided a dashboard view of major players along with the market share, and their key business strategies. This would enable clients to evaluate strategies deployed by market leaders and help them develop effective strategies consequently. The first stage of research includes the formulation of a preliminary hypothesis, which was considered from primary as well as secondary approaches. The subsequent stages involved triangulation of data gathered from the two approaches. To determine the market trends and opportunities, the global flexographic printing machine market report has been segmented on the basis of five criteria: product type, technology, application, coloring capacity, and region/country. For the final data analysis of the flexographic printing machine market, we have considered 2017 as the base year and basic data was collected from public sources as well as sources such as the company’s annual reports, World Bank, newsletters, published reports on government or public sites, industry association’s reports and data. The collected data was further validated from product manufacturers, end-user procurement agencies, distributors and regional representatives. For market estimation, we have considered both demand side as well as supply-side drivers. Historical data includes data for the period 2013-2017 and forecast estimation for the period 2018-2028. We have considered the product and technology developments, market trends, mergers and acquisitions, and strategic developments among the manufactures of flexographic printing machine. The forecast presented in the global flexographic printing machine report evaluates the actual market size (US$ Mn) in 2017 with regard to the product (flexographic printing machine) and the expected market value in the global flexographic printing machine market over the forecast period. Moreover, the report shows the market attractiveness for the upcoming ten years. This market attractiveness value helps clients identify real opportunities in the global flexographic printing machine market. Further, we also considered the regulations of flexographic printing machine for estimation of consumption of flexographic printing machine for every region. For instance, in Europe, there are number of stringent regulations for electricity consumption, and the usage of flexographic printing machine inks, which have moderate impact on the global flexographic printing machine market. Moreover, to analyze the market share and competition analysis section, we tracked the company’s key developments like collaboration, expansion, mergers & acquisitions, new orders, product launches, awards and recognition. For market share and tier analysis based on key and regional players of flexographic printing machine, we collected the data from annual reports published by the manufacturers of flexographic printing machine and estimated the market share of players on the basis of the distribution of the product at the regional level. A flexographic printing machine is a type of printing machine commonly used in packaging and labelling applications. It is an advanced version of letterpress used to print on paper, plastic, woven and non-woven materials using water-based or ultra violet methods. A flexographic printing machine is an efficient printing press used for medium and long run print applications. Currently, flexographic printing machines with a coloring capacity of 6 colors and above are widely used in packaging and labelling end-use applications. These flexographic printing machines cover more than 54% of the market in terms of value. Flexographic printing machines are predominantly deployed in packaging applications wherein, at present, inline flexographic printing machines have been witnessing rapid growth in terms of adoption rate, primarily driven by western countries. Flexographic printing machines are used for industrial printing operations, for both the sides of printing material surfaces. Narrow-width flexographic printing machines are commonly used for labelling, whereas wide-width machines are used for packaging applications. Soaring sales of used flexographic printing machines in developing economies is a significant factor expected to hamper the growth of the flexographic printing machine market. The growth of servo drive technology and increasing adoption of automation with remote monitoring are among the other important factors driving the adoption of flexographic printing machines. Among various printing machines, flexographic printing machines are known for high energy consumption. Focusing on minimizing energy consumption and adhering to regulations is an important factor expected to drive the market during the forecast period. The flexographic printing machine market has been a low volume market, due to its high capital cost, and is expected to register steady growth during the forecast period, particularly across countries such as China, India, Indonesia, Vietnam, Mexico, and Brazil. By product type, the flexographic printing machine market has been segmented into inline type press, stack type press, and central impression type press. This research study on the flexographic printing machine market also provides key information pertaining to end-use applications, such as print media, which covers newspapers, books & magazines and advertisements. The report only covers the sales of new flexographic printing machines and rental businesses; and the sales of used flexographic printing machines has not been considered. This global flexographic printing machine market study also does not take into account the maintenance and customization services provided by players. The global flexographic printing machine market is estimated to have been valued at US$ 1,900.1 Mn at the end of 2018 and is anticipated to reach US$ 3,574.6 Mn by the end of 2028. During the forecast period, the global flexographic printing machine market is expected to expand at a CAGR of 6.5%. The incremental opportunity created by the global flexographic printing machine market between 2018 and 2028 is anticipated to be pegged at US$ 1,674.5 Mn. The global flexographic printing machine market is expected to witness a steady growth rate in the coming years, driven by investments in new production units by leading manufacturers. Merger and acquisition activities among the prominent players in the global flexographic printing machine market are expected to create positive growth momentum in the future. In addition, collaborations between automation providers and manufacturers are further contributing to this momentum. The presence of competitive products such as offset printing have negatively influenced the sales of new flexographic printing machines; however, the rising adoption of automated flexographic printing machines and the increasing replacement rate expected to positively affect market growth. Western countries are driving the adoption of 6 color & above flexographic printing machines, which is expected to increase revenue generation during the forecast period. Growing investments in Asia for the production of foods and beverages are expected to support the growth of the flexographic printing machine market during the projected period. 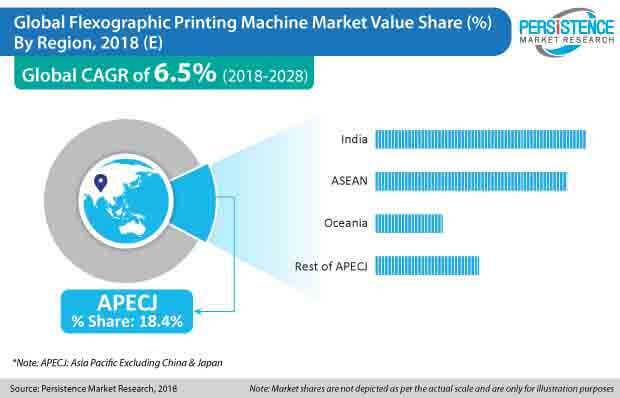 Further, strengthening of the distribution channel in developing economies is expected to further drive the sales of flexographic printing machines. Some of the leading players reported in this study on the global flexographic printing machine market are Bobst Group SA, Gallus (Heidelberger Druckmaschinen AG), Koenig & Bauer, KOMORI Corporation, Mark Andy Inc., WINDMOELLER & HOELSCHER CORPORATION, and Barry-Wehmiller Companies, among others. Key participants in the global flexographic printing machine market, a number of which are multinational players, offer flexographic printing machines for packaging and labelling applications in various regions. In addition, manufacturers of intelligent servo drives for flexographic printing machines from Europe and Asia are exporting their machines to developing regions, such as ASEAN countries. In recent times, competition in the global market has intensified, which has created opportunities for collaborations with sales and distribution companies. Many Chinese players are offering low-cost stack type flexographic printing machines, which is supporting sales in the Asian region, but negatively affecting the market share of Western players. Indian players are observed to be targeting regions such as Middle East and Africa and ASEAN countries. During the forecast period, competition in the market is expected to further intensify with the growth of Asian players.